Are you enticed by the idea of starting your own business? Do you enjoy finding unique solutions to problems? Does the idea of single-handedly guiding a business to success interest you? Then you might be an entrepreneur. BCIT’s Entrepreneurship diploma was developed specifically to give people like you the focused, intensive training necessary for success in creating, guiding, and managing businesses. Whether you're looking to start your own business from scratch or expand on an idea you're already working on, this program will train you with hands-on, real-world skills and knowledge. To learn more about how the Entrepreneurship diploma can turn your idea into a successful enterprise, visit the Program Details page. Who should apply for the Entrepreneurship Diploma? If any or all of these apply to you, visit the Program Entry page to start training for your entrepreneurial career today. Do you have work experience or other post-secondary education? If you do, you might qualify for course credits to help speed up your training. Visit our advanced placement page to learn more. The Entrepreneurship diploma program gives you a broad base of business knowledge, including specialized training in the development and growth of new products and services. Some graduates of the program start their own company, while others use the intensive training to improve an existing company, whether it's one they created or someone else's. Because entrepreneurs can focus on the wider picture of businesses and have a strong, general foundation, their training can be applied to almost any industry, helping to protect them from shifts within a certain field that industry-specialists can't avoid. Graduates of the program will be qualified to start their own company, or find work as coordinators, marketing assistants, or potentially managerial roles at organizations locally and globally. To learn more about the career opportunities and other options available to grads, see the Graduating and Jobs page. You may qualify for advanced placement based on an assessment by the BCIT SITE Centre’s Advanced Placement and Prior Learning (APPL) program. Visit the SITE Centre to learn more. The two-year Marketing Management Diploma program shares a common first year of core business subjects. The second year of the program focuses on specific fields of marketing expertise. Candidates who wish to apply to the Entrepreneurship option must declare this option/specialization at the time of application. The courses in the BCIT Entrepreneurship diploma program are designed by entrepreneurs so you get practical-focused training to start and build your own business. You can also bring fresh ideas and entrepreneurial spirit to help grow an existing company. Some of the hands-on practice you'll get in this two-year program include a two-day-a-week practicum working with actual entrepreneurial ventures. Your classroom courses include studies of real-world, applicable issues like New Product and Service Development, Essentials of Marketing, Sales Skills, Internet Marketing Applications, and more. The unique Self Employment course puts the student in the place of an entrepreneur with a new idea, and teaches the student how to build the idea into a business. The course covers the basics of starting a business, from idea assessment to insurance, in a step by step manner. At the end of the course, the student will be prepared to pursue a detailed checklist of steps to create a new business venture. Introduces the fundamentals of project management. Includes the unique characteristics of projects and fundamentals of project planning using techniques such as WBS, Gantt charts, CPM, maintenance and control of projects using check points and milestones, communication, and common sources of difficulty in project management. This course includes the use of MS Project, in order to familiarize students with typical PM software aids. Note: This program is completing a curriculum assessment. Some courses may be revised, added or deleted during the academic year. In BCIT's two-year Entrepreneurship diploma program, you'll first concentrate on developing a solid understanding of core business concepts that apply across fields and industries. This includes integrated marketing and communications for global and local markets, computer skills and internet marketing basics, business communications, technical sales, economics, business math, and accounting practices. You'll not only learn from successful entrepreneurs, you'll build a solid business education foundation that will be applicable in all of your future endeavours. A typical week features at least 25 hours in class, and many hours spent working on assignments and projects outside of the classroom. The intense nature of the learning experience will help you develop the time-management and priority-setting skills that successful entrepreneurs need. Lectures provide instruction in the principles of business and are delivered by instructors with real-world experience, teaching applied skills you can actually use when you graduate. Then, in lab sessions with 22 other students, you'll practice and master these skills, working directly with School of Business faculty whose priority is helping you learn by doing. You may be called upon to analyze what a one-person company should do to grow. Or you may be asked to convince other classmates to endorse your plan for a large company. Teamwork is a core value in the School of Business, as it is in the business world. You'll work in teams in most of your courses. Team activity will help you get an early start on building the delegation, goal-setting and leadership skills you will need as an entrepreneur. Additionally, the groups established at BCIT are the start of your business network, providing you a legacy of contacts and support that lasts beyond graduation. Presentations are a big part of classroom life. You will make formal presentations to industry clients in your practicum and project courses. Your lab sessions will often include more informal presentations in groups or by yourself. Practice at presenting your views will build confidence, help you learn to think on your feet, and develop public speaking skills. You may also choose to expand your learning window at BCIT by playing a role in one of the many active campus student organizations, such as Enactus BCIT and the BCIT Marketing Association. Entrepreneurship students often play leading roles in these organizations to help build contacts and practice the key skills to succeed in their future entrepreneurial careers. At the end of the first year of the program, students having failed one course not in Marketing may continue in the program. Their program option will be held if the failed course is successfully completed at BCIT, 10 days prior to the next term start up. If they are completing the courses at another institution then the students must provide proof of registration for the outstanding course no later than 60 calendar days prior to the term start date. An official transcript with the final grade must also be submitted before acceptance into the program option is granted. Students having failed two courses not in Marketing may continue in the program but their program option seat will not be held. If the failed courses are successfully completed at BCIT before term start up, the student can re-apply to their preferred option. If completing the courses at another institution students must provide proof of registration for the outstanding course(s) no later than 60 calendar days prior to the term start date. An official transcript with the final grade(s) must also be submitted before acceptance into the program option is granted. Graduates can also pursue degree completion through BCIT's Bachelor of Business Administration program. Entrepreneurs are masters at adaptation and innovation and can find opportunity in almost any field. By being business generalists, graduates of the Entrepreneurship diploma can apply their training to everything from starting their own company to helping existing companies develop new business opportunities and strategies. Graduates of the program are well rounded and flexible in their skills, giving them an ability to work in almost any industry for long-term job prospects, regardless of a certain industry's recession. Qualified graduates of the Entrepreneurship diploma program may also apply for acceptance into BCIT's existing Bachelor of Business Administration (BBA) degree program. This program will ladder into the BBA program, which you can complete full-time in the day, or around your new career as part-time in the evenings. Do you have a degree, diploma, or completed a substantial amount of post-secondary courses? You may qualify for advanced placement into the Marketing Management - Entrepreneurship program. Students that qualify for advanced placement can enter the program in the middle of first year or the beginning of the second year depending on the number of transfer credits received. For more information about eligibility requirements and the application process, please download the Marketing Management - Entrepreneurship Advanced Placement Guide [PDF]. 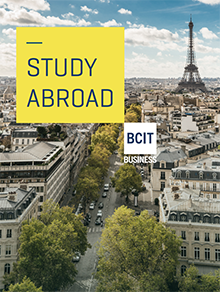 A BCIT Business Consulting Project provides second year Entrepreneurship students the opportunity to work over a 16 week period with an organization to conduct extensive market research and prepare a marketing plan or business plan. Students work in a team of two or three to identify potential opportunities, conduct research, and recommend effective solutions. Students complete a comprehensive written report and present an oral presentation to the sponsoring organization outlining the student team's marketing recommendations and solutions. The core courses in the program are taught to Entrepreneurship students by Rick Kroetsch and Brian Giffen, who have over 40 years of combined teaching experience in this field. Both faculty members have received the School of Business Teaching Excellence Award, and regularly work with new and growing ventures as advisors. We also maintain an active advisory committee to keep the program curriculum current with entrepreneurial trends.